- Coming Soon - Our New Aussie Ebook! 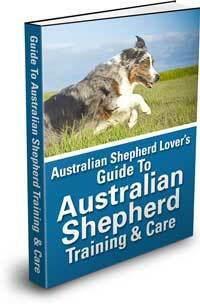 Work is underway on our Ultimate Guide to Australian Shepherd Training & Care ebook. It'll have lots of information about training your Aussie and dealing with all kinds of behavior problems. Plus it's going to feature tons of photos sent in by readers. All for only $17. * Right now I'm working on the page layout and design. I used to work in the advertising department at a major newspaper so I'm having lots of fun with this project. When it's released it will be in ebook format (PDF), so you will be able to download it immediately... with no shipping charges or waiting! *It will be $27, BUT as a special thank you to our newsletter subscribers and Facebook fans I will be providing a special coupon code for $10 off, making it only $17. I want to make sure it is an aussome value for every Aussie owner. I'll keep you posted in future newsletters and send you the special DISCOUNT CODE when it's released. If you are considering getting an Aussie (or another one) there are many that are in need of loving homes. Don't like your cats scratching your furniture? Dundee is on the case! 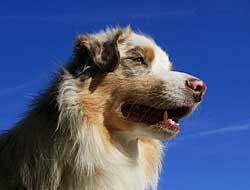 Charles Hall of Sullivan, Maine shares this story about his cat herding Aussie. Affordable Agility -- Getting started with agility training? If you are looking for reasonably priced agility equipment and starter kits so you can set up your own course in your back yard or nearby park I suggest you have a look at the Affordable Agility website. Houston is a a 14 week old red-tri Australian Shepherd from Germany and he is as cute as can be. Thanks to Michael Twesten for sharing this photo. "If a dog jumps in your lap, it is because he is fond of you; but if a cat does the same thing, it is because your lap is warmer."